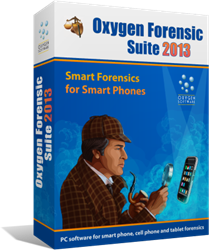 Oxygen Forensics updates Oxygen Forensic® Suite 2013, the company’s flagship mobile forensic and evidence discovery solution, with greater support for Android devices. The new release greatly improves physical acquisition for Android smartphones and tablets, and adds the ability to decrypt the content of certain Samsung phones such as Galaxy SIII. Oxygen developers did a hard job of understanding and implementing algorithms to ensure that investigators are able to access information contained in such images. In this release, Oxygen Forensic® Suite fully supports the decryption of Samsung phones. Oxygen Forensic® Suite 5.4 offers significant improvements when acquiring Android based devices. Implementing a new extraction tool, Oxygen Forensic® Extractor, the company’s mobile forensic toolkit offers experts the choice of multiple acquisition options including physical acquisition, backup analysis, or the traditional approach available in prior editions. Physical acquisition of Android devices has been significantly improved as well, offering greater chances of successful acquisition than ever before. Finally, the new release enables the decryption of flash images captured from Samsung Galaxy SIII family of smartphones. In this release, Oxygen Forensic® Suite updates its mobile data extraction tool, Oxygen Forensic® Extractor. The updated version of this tool implements completely redesigned extraction methods for Android devices. The two methods available include Recommended and Advanced. By choosing one of the two options, users can either perform acquisition automatically or gain access to advanced acquisition settings. Physical acquisition is the preferred method of forensic acquisition for mobile devices such as smartphones and tablets. Investigators give preference to physical acquisition, when available, as this is the only method to return the complete content of the device along with unallocated space, containing the remnants of destroyed evidence. When going physical, examiners could obtain more information from the device than by using any other method. Unlike other acquisition methods, physical acquisition has guaranteed timeframe, allowing to acquire the entire content of a typical 16-GB device in approximately 45 minutes. After acquiring information from an Android device, experts can use the many powerful analytic features of Oxygen Forensic® Suite to investigate the content of the device. When it comes to Android, Samsung smartphones occupy a specific niche. The company was not happy with the level of data protection delivered by the standard Android flash encryption algorithm, and developed its own protection algorithms. Samsung implementation of data protection relies heavily on hardware encryption based on the passcode, which is not unlike what Apple does in its iOS devices. As a result, decrypting the content of flash images captured off Samsung Galaxy smartphones such as Samsung SIII is not an easy task even if the original passcode is known. Oxygen developers did a hard job of understanding and implementing this algorithm to ensure that investigators are able to access information contained in such images. In this release, Oxygen Forensic® Suite fully supports the decryption of Samsung phones belonging to SII and SIII families. Oxygen Forensic® Suite 2013 helps investigators and forensic specialists access and analyze data from a variety of mobile devices such as cell phones, smartphones, communicators, PDA and tablet PCs. Currently supporting more than 7,000 different models, Oxygen Forensic® Suite 2013 covers the widest range of mobile devices compared to competition, and allows fully automated acquisition and analysis of supported devices. Another signature feature of Oxygen Forensic® Suite allows investigators to perform a global search on all devices ever analyzed with the toolkit. The global search quickly reveals any connections (e.g. common contacts, exchanged calls, texts or emails) between the phone owners. Oxygen Forensic® Suite 2013 guarantees zero-footprint operation, leaving no traces and making no modifications to the content of the devices. This makes it the tool of choice among government and law enforcement agencies, security services, and forensic organizations in more than fifty countries. Founded in 2000, Oxygen Forensics is the worldwide leading maker of the advanced forensic data examination tools for smartphones and other mobile devices. The company is dedicated to delivering the most universal forensic solution covering the widest range of mobile devices running Android, iOS, Blackberry, Windows Phone, Symbian and other operating systems. Law enforcement and government agencies, institutions, corporations and private investigators, help desk personnel and thousands of private consumers rely on Oxygen Forensics products to ensure evidence availability in the event of mobile device data analysis and recovery. Oxygen Forensics customers include various US and European federal and state agencies such as the IRS, US Army, US Department of Defense (DOD), US Department of Justice, US Department of Homeland Security, US Department of Transportation, US Postal Service, US Supreme Court, European Commission, London Metropolitan Police, French National Police and Gendarmerie, PricewaterhouseCoopers, Ernst & Young, and many others. As a result, Oxygen Forensic® Suite receives great response at forensic conferences, exhibitions and trainings, and occupies a spot on the top of the list in relevant tests for extracting more data than competitors.